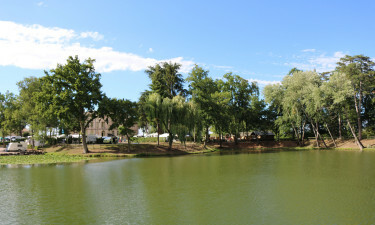 Le Domaine de l'Epervière luxury camping site is set in the heart of a splendid 16th century French château. Located in Gigny, Burgundy, the park is surrounded by sprawling vineyards and magical woodlands making it an idyllic spot for holidaying families. The site has exceptional amenities and facilities and offers a wide range of mobile home options. To avail of accommodation, or just make a general enquiry, contact LUX-camp today. About Le Domaine de l'Epervière Campsite. What is unique about Le Domaine de l'Epervière camping holiday? Perfect destination for wine enthusiasts. Luxury camping setting within the confines of a castle. Close to tourist hotspot - Chalon-sur-Sâone. Heated indoor and outdoor pools. 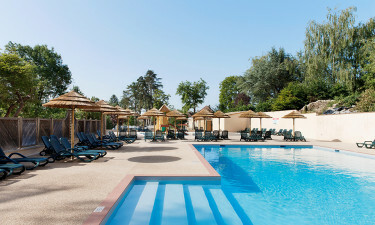 At Le Domaine de l'Epervière campsite, you will be spoilt for choice as there are two wonderful swimming pools. The outdoor pool has a selection of water slides to keep children busy, and the friendly helpful staff organise water games and other activities. There is also a kids’ club onsite, so you can bask peacefully in the French sunshine on a terraced lounger under a thatched parasol. There is also a smaller indoor pool, incorporating some of the château's natural wood and cobblestone walls. Fancy a change of swimming scenery? The site is close to a beautiful lake and the river Sâone is only a kilometre away. The Burgundy region is home to France's many winemaking towns, and Chalon-sur-Sâone is one you might like to visit as it is only thirty minutes away from the camping site. This scenic village that sits snugly on the River Sâone is renowned for the more famous wines like Mercurey and Rully. The town is home to weekly markets that sell fresh produce, as well as a majestic 19th century Roman-inspired cathedral. There is a wonderful array of shops, bars and cafes surrounding the cathedral, all of which make for a great family day out. On site, choose from a variety of physical activities to keep you busy; table tennis tables, a football pitch and a boules pitch are all situated in the regal moat area of the château. If you are a fishing enthusiast, the nearby lake and the river provide ample fishing opportunities; you can even buy fishing rods in the onsite shop. The surrounding vineyards and lush forests make for peaceful and relaxing walking excursions. If you would rather view the beauty from the seat of a bike, there are adult and children's cycles for hire. 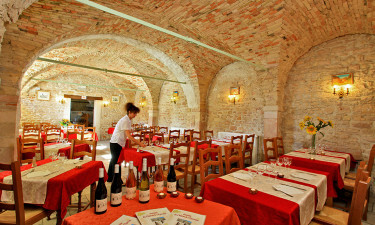 This luxury holiday camp also has an onsite restaurant - the Château de l'Epervière. It has indoor and terraced seating in the courtyard, and offers an extensive menu of French and international dishes that is sure to cater for all tastes. There is a well-stocked grocery store that sells everything from wine to fruit, vegetables and fresh bread. Enjoy a glass of wine in the lively, friendly bar.